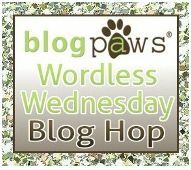 Bringing up Bella: Wordless Wednesday 121 - So cute. Yes you! Look at those beautiful eyes! What a sweet expression. She's far too adorable. You sure are Bella. Such a sweet face! Such a worried baby dog! Rooo Bella you're such a cutie pie! *Waggy tail* Those agility jumps look mighty pawsome too! Is someone at agility class and happy about it? I always find it a bit ridiculous when people write "adorbs," but adorbs is definitely a fitting description for this picture!! I like the looks of that leash--is it any kind of special leash? Hey - is that Agility stuff in the back ground? I love the game called agility! Do you get to play lots? Hey Donna - how you been? Miss you on FB. Gotta head over to see how the pups are doing. Well, whoever did the tangling of the leashes made it look very professional! :) I'll have to check out the Mutley leash, thanks for sharing the link.